Which Wine Opener has Won the Hearts of Wine Lovers Everywhere? The Most Reliable and Durable Lever Corkscrew on the Market. 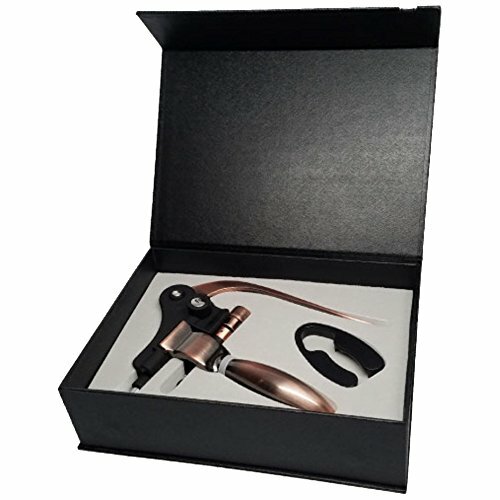 The GSCW Wine Opener is for every wine lover looking for a tool that opens any bottle without struggling that is 100% foolproof with both superior durability and style. Here's a huge problem you face right now: It's settling with a cheap corkscrew that breaks easily and doesn't hold up. But that's not the end of your problems. What makes this even worse is the fact that you end up disappointing yourself and your self confidence! Your wine experience quickly becomes a painful and miserable one. And, worst of all, many wine drinkers can't get past the idea that all corkscrews are the same, so you should buy the cheapest one. All of this can make opening a simple wine bottle in a flash a nightmare! But luckily for you, there's now a solution! So, if you're a wine lover who really wants to open wine bottles without a struggle, and finally fill the void in finding the best wine accessory on the market with proven durability and style, then the "GSCWWine Opener" is the answer you've been looking for! It's up to you to Open any wine bottle effortlessly. Just one simple motion is required as you let the lever do all the work for you - Order Now! If you have any questions about this product by GSCW, contact us by completing and submitting the form below. If you are looking for a specif part number, please include it with your message.